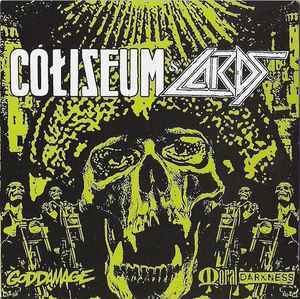 Collects material from Coliseum's Goddamage EP (tracks 3 to 10), Lords' Moral Darkness 7" (tracks 12 to 16) and the Maximum Louisville Split Series Volume I Split 7" (tracks 18 to 23), all released on Auxiliary Records. Includes a spoken word track explaining the circumstances of "Colordsiseum," a live collaboration by both bands in Summer 2004 and one collaborative track. 1 & 2 recorded January 2006 at Headbanging Kill Your Momma Music in Louisville. 3 to 10 recorded 11-13 2004 at Downtown Recording in Louisville. Mastered at West West Side. 11 to 17 written and recorded at Headbanging Kill Your Momma Music. 18 & 19 recorded May 2004 at Headbanging Kill Your Momma Music. 21 to 23 written and recorded at Headbanging Kill Your Momma Music. CD assembled and mastered at Headbanging Kill Your Momma Music. Sold while Coliseum and Lords were on tour in Europe. Under license from Auxiliary Records.